Fruit-Full is a whole new kind of fruity experience! It’s a brand new Mobile Game App! It’s your very own Tru-Cape apple and pear farm right at your finger-tips! With the help of James and the Tru-Cape kidz, the player will learn about farming, managing resources, logistics, packing and selling, all while having loads of fun. It’s your farm so you get to make the rules! Shine Interactive is proud to bring Fruit-Full to life in this massive collaboration between Tru-Cape, Red Cherry Interactive and Big Brave alive in a fully realised mobile game. 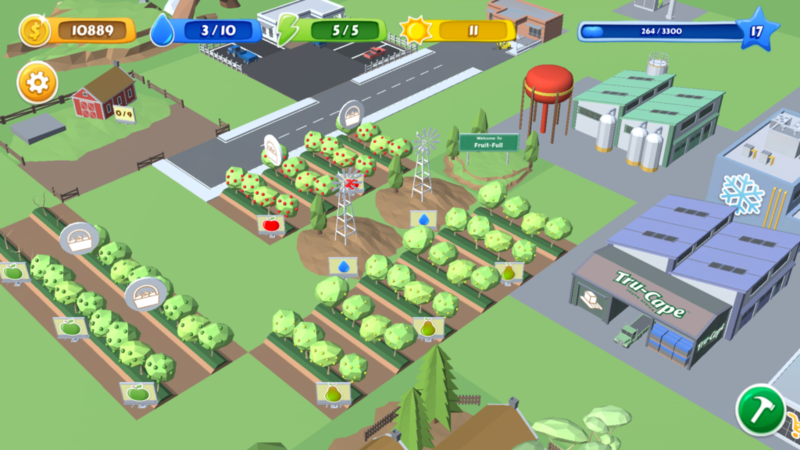 The game features Farm-ville style gameplay, where the player can create and build their vision of an apple and pear farm, complete with logistics and packing warehouse. We’re absolutely thrilled how the game turned out. This is one of the biggest projects we’ve ever worked on. Fruit-Full has an impressive development timeline too. It all started with a visit to the Tru-Cape orchards and Two-a-Day packing warehouses, where we first needed to learn ourselves how the apple and pear industry works. What we thought was a simple process turned out to be an incredibly complex industry. Once we fully understood the intricacies, we were finally ready to jump to work designing the game. It took a long time to nail down the process as a very simple game, educating players as they play. In the game, players are expected to take care of their apple and pear farms. They have the ability to freely create their desired layout, in whichever way they feel meet the farm’s requirements. Once the fruit is ripe, the harvest process can start. Trucks are ready to transport the fruit to the warehouse where it can be further processed by putting it into cold storage, washing and sorting the fruit and then finally packaging it. The game features a market where the player can sell their produce to a few regular customers who are eager to purchase produce. We hope you enjoy the game as much as we enjoyed creating it. For more information about the game, visit the Fruit-Full Website. Posted in Games and tagged Apps, Big Brave, Fruit, Games, Mobile Game.